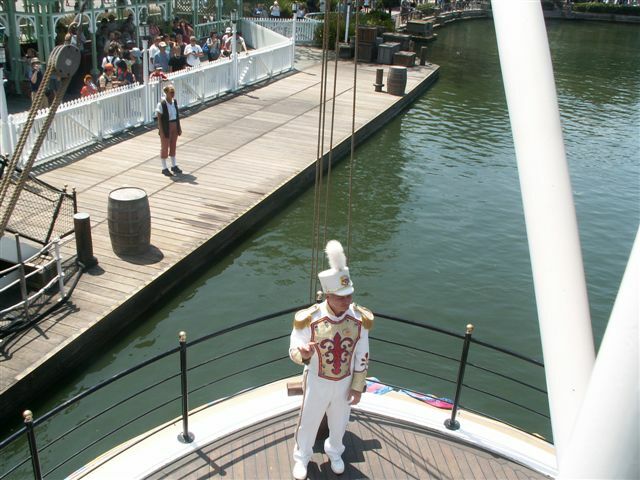 Once, aboard I headed up one deck and staked out a space on the front rail on the ship. 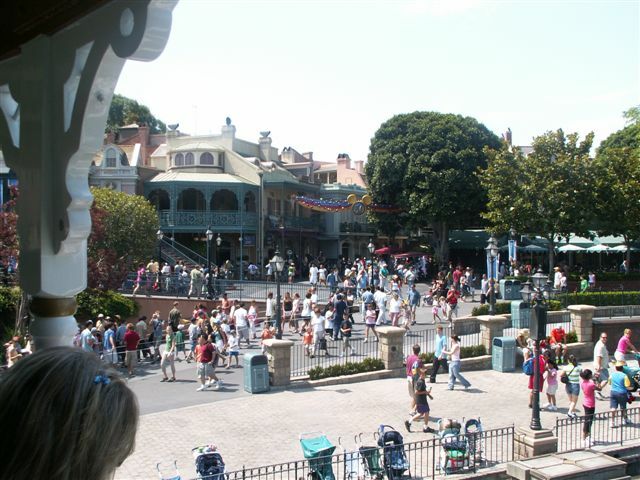 I took in the elevated view and snapped a few photos. 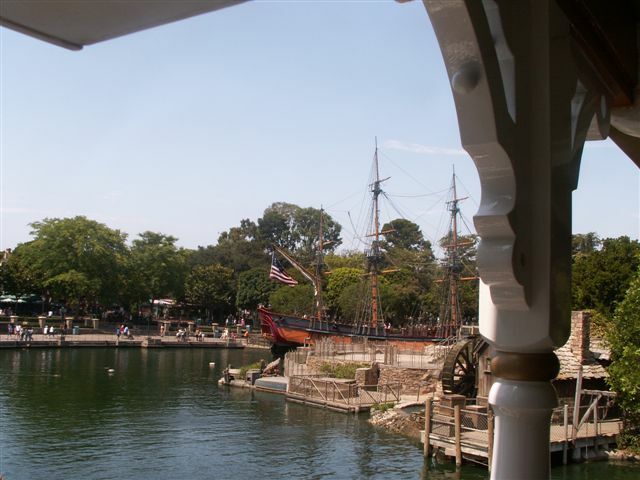 Among other things, the Columbia was just backing out of Fowlers Harbor to begin its daily runs. 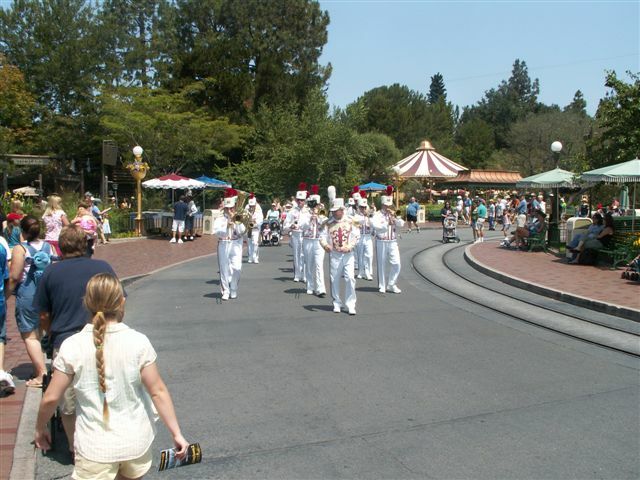 For a moment I was worried that perhaps the band might be a no show (things do happen sometimes it may be unavaiodable), but then I saw a cast member near the exit who seemed to be keeping a gate open for them, as if he was indeed expecting the band, and after a few minutes, there they were, marching over from Main Street, probably from the gate I had waited by the previous day. 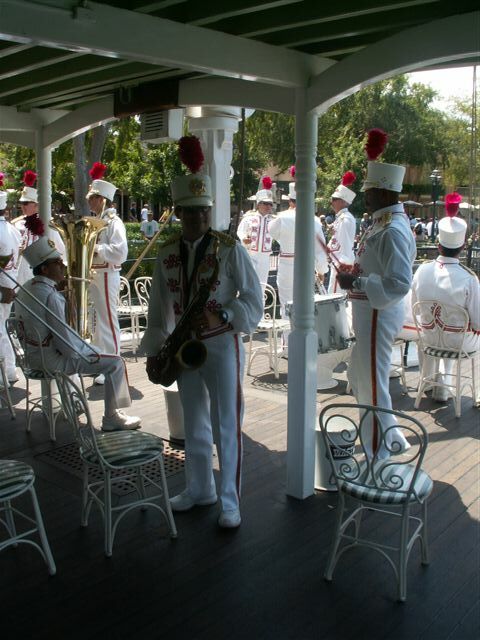 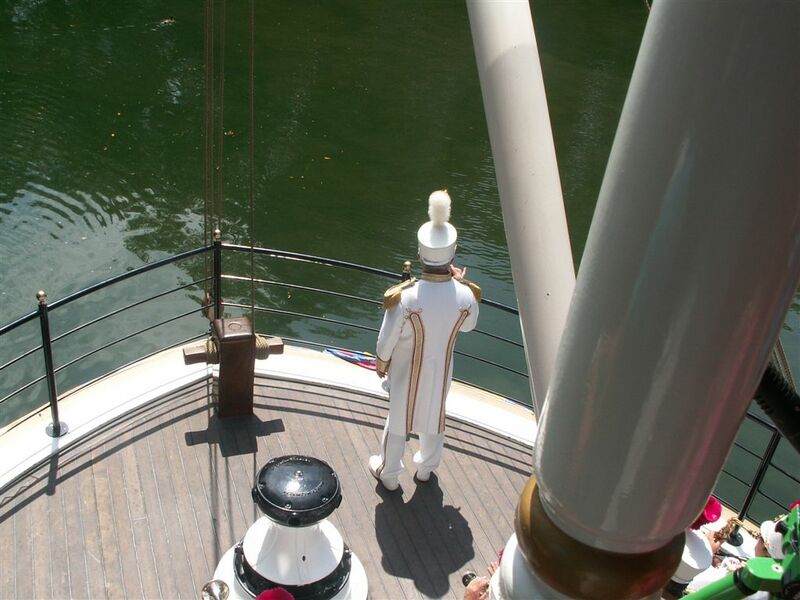 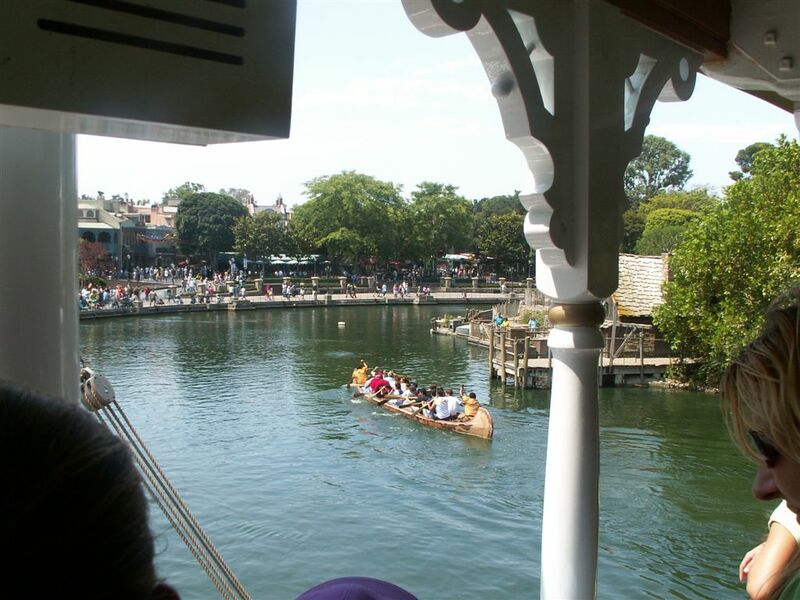 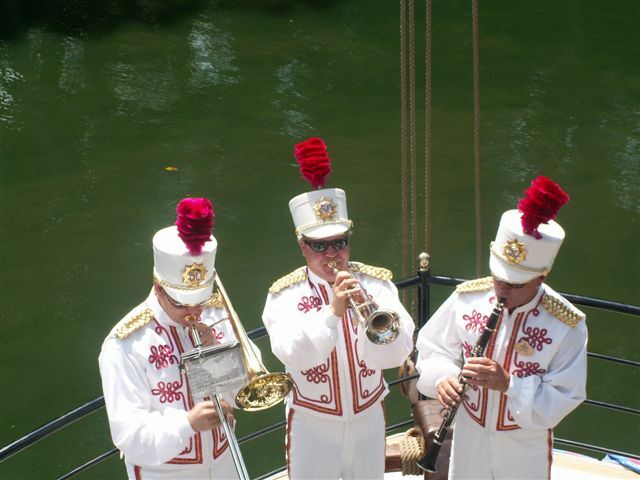 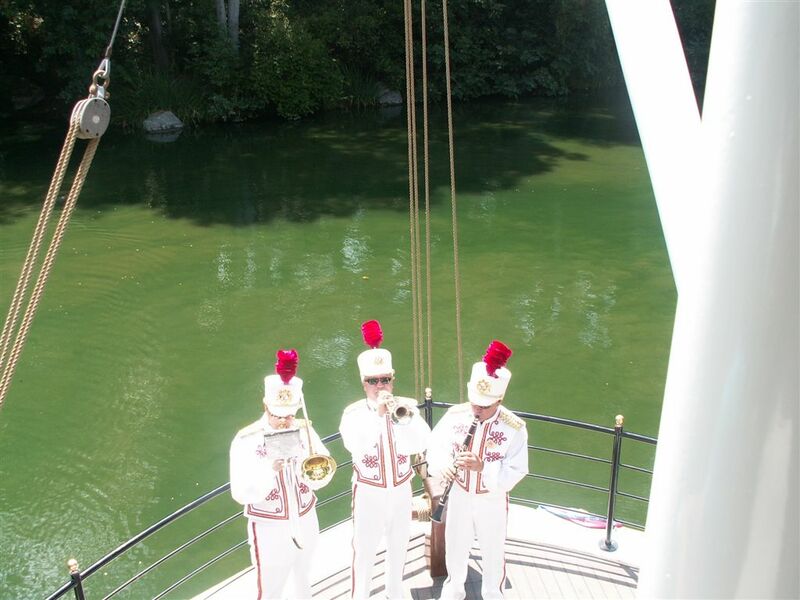 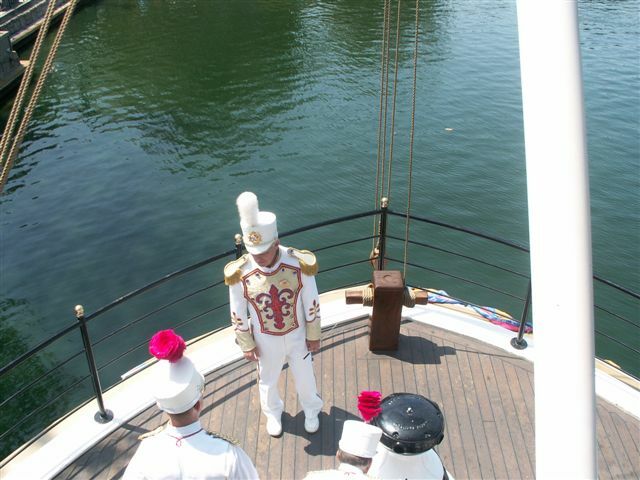 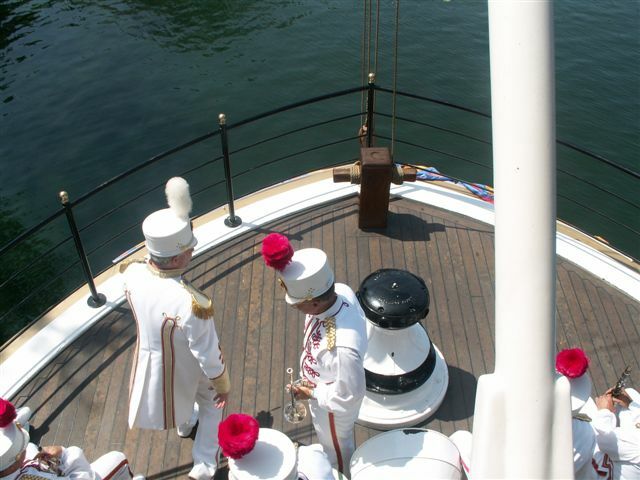 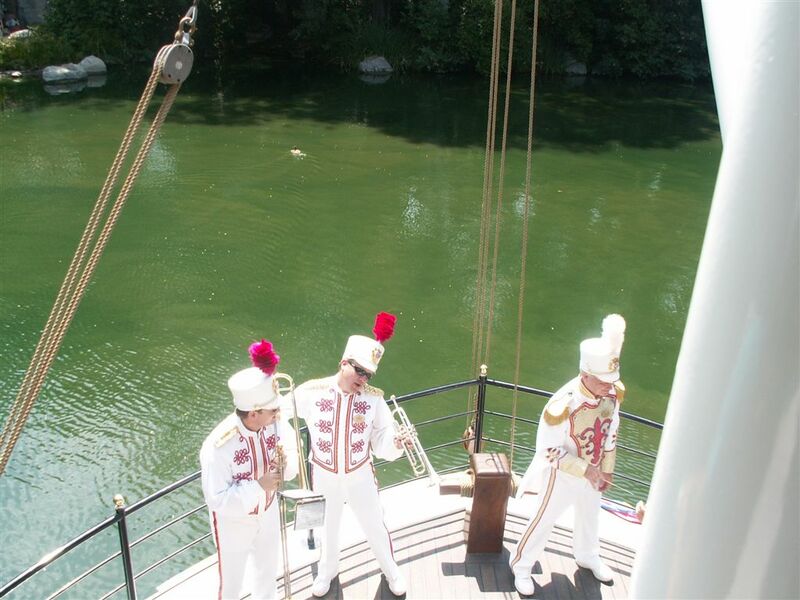 Once the band was aboard the crew prepard to leave the dock, and the band started a medley of Disney Songs, Zip-A-Dee-Do-Dah, Heigh-Ho, Winnie the Pooh, Someday My prince Will Come, Davy Crockett, and It's A Small World. 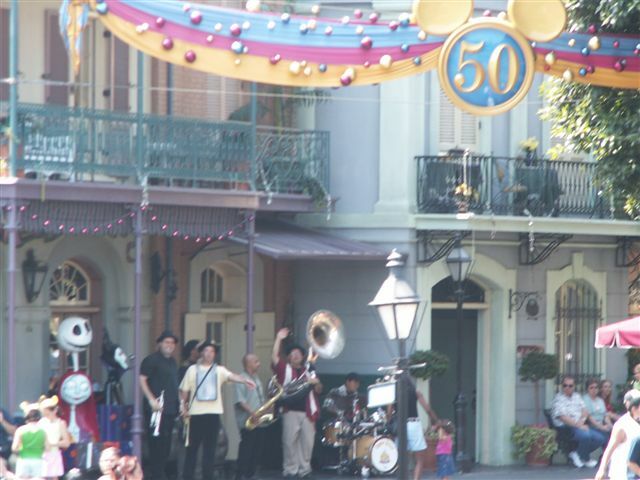 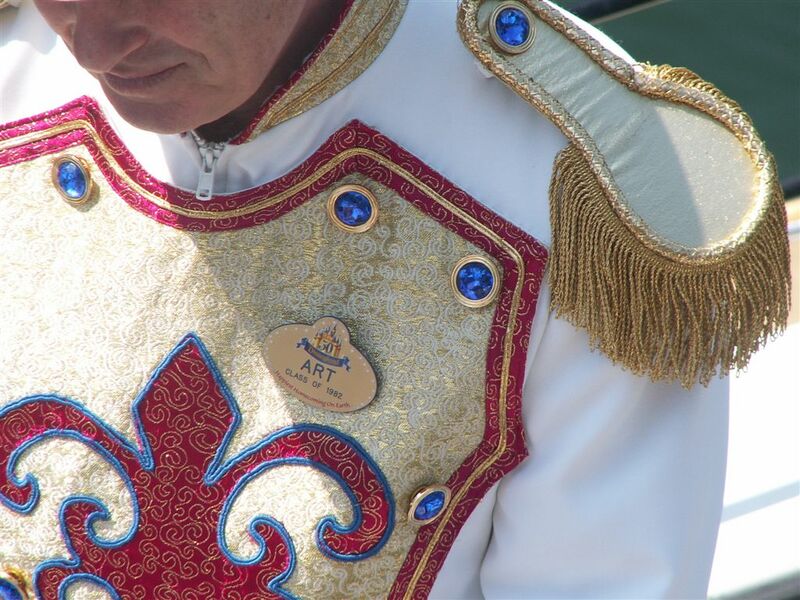 As they Finished thier Medley the Bayou Brass over on market street fired up thier horns loud in a sort of competition, so in a few moments the DL band leader launced into Yo-Ho to " return the fire" so to speak. 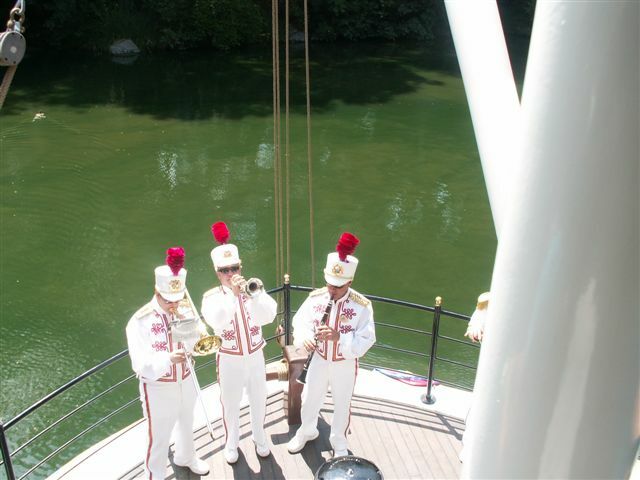 The band does take breaks on some of the less busy portions of the river, and after Yo-ho they rook one of these breaks. They still play a good number of songs during this set and by the time they get off the Twain form ranks and march back to Main Street they've been on-stage for over 45 minutes, so you can see that they might need some rests in there especially I'm thinking for those who have to blow to perform on their instruments, you'd get dry lips after a while I'd think. As we pulled into Critter country they played a full version of Davy Crockett (as compared to the bit of it they played in the medley at the start of the cruise). 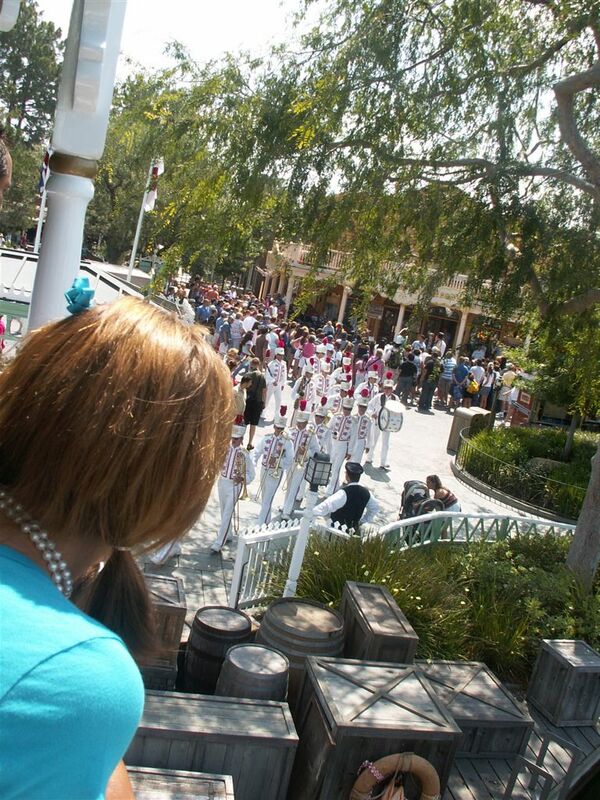 Then another break. 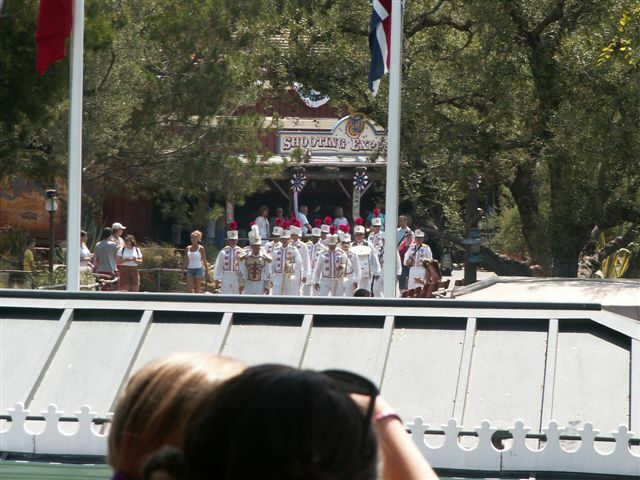 On the back corner of the river, near the Indian Village, they played By The Sea, during this several members stepped up to the front for breif solos. 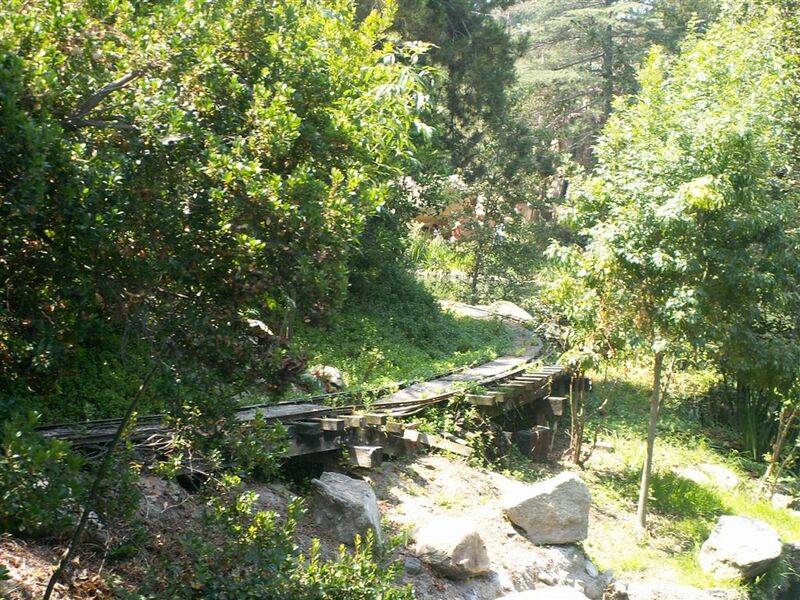 After By the Sea they took what was probably their longest break, but there was a lot. 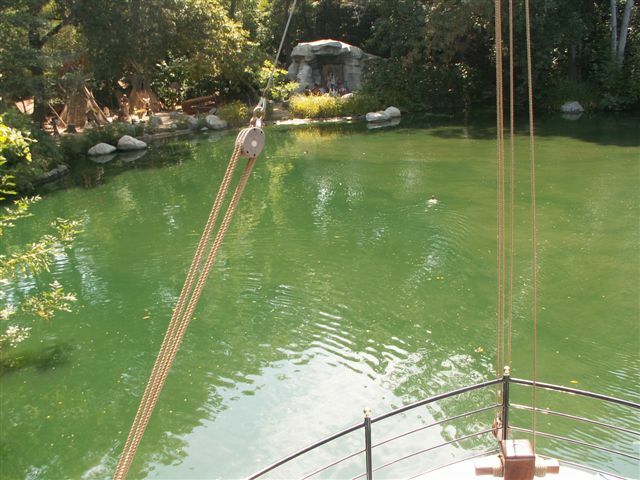 I liked seeing on this section of river. 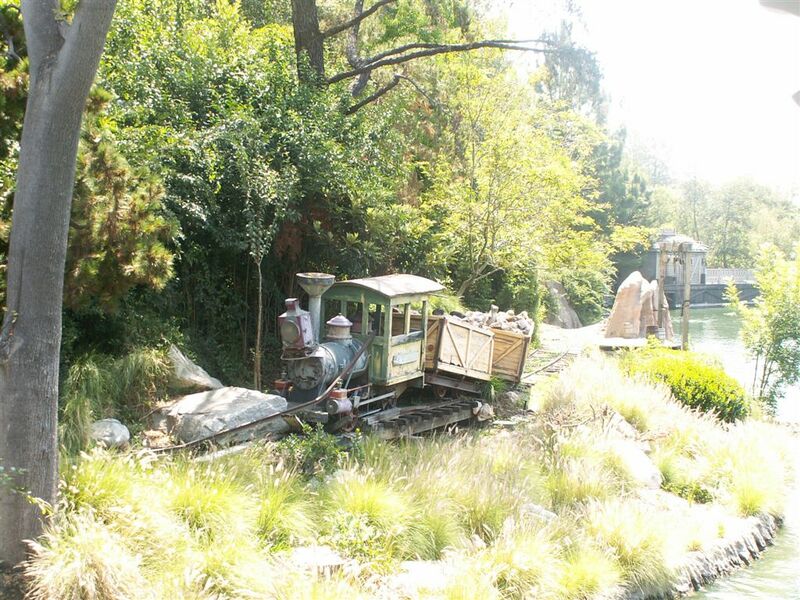 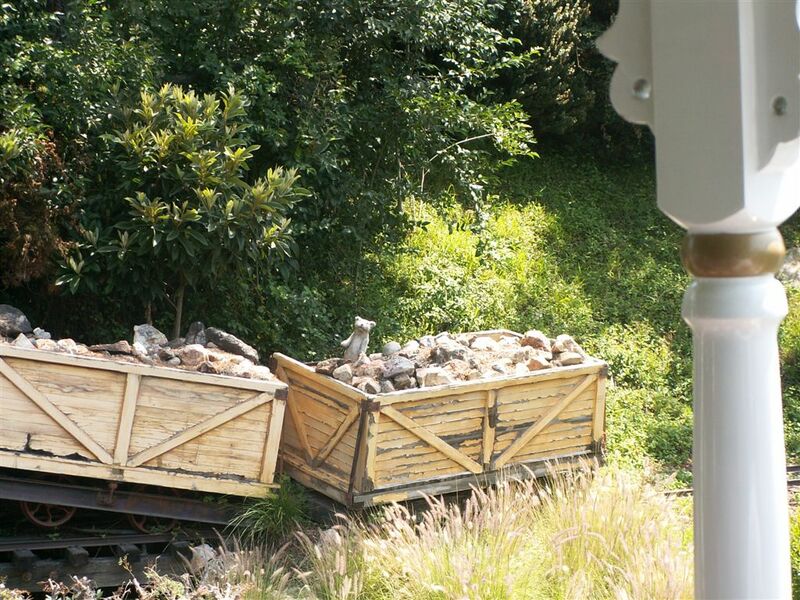 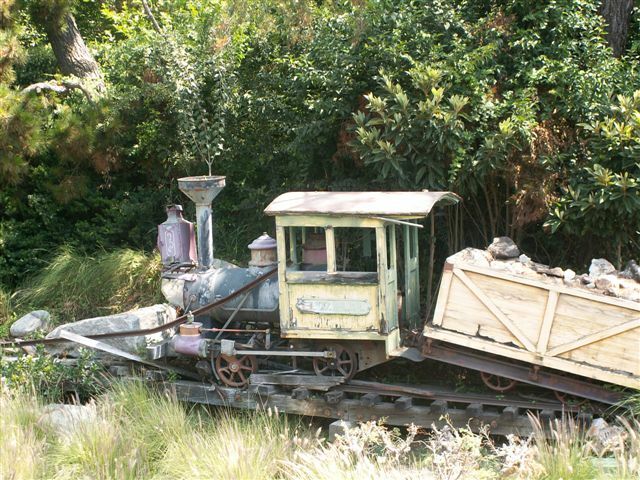 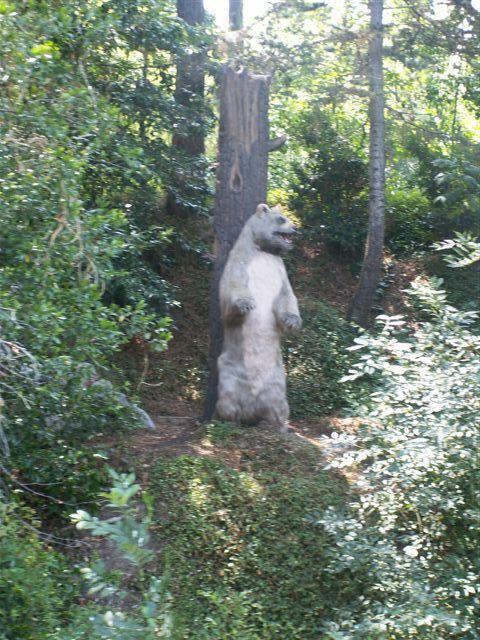 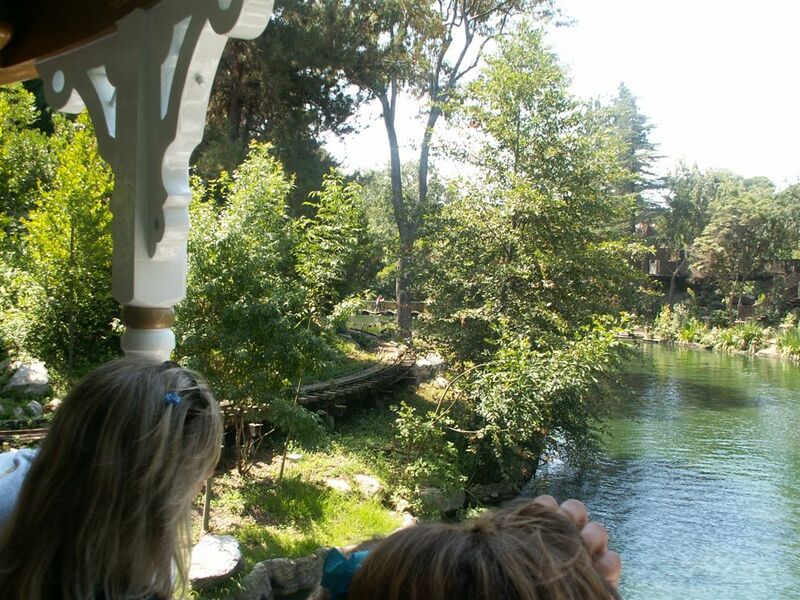 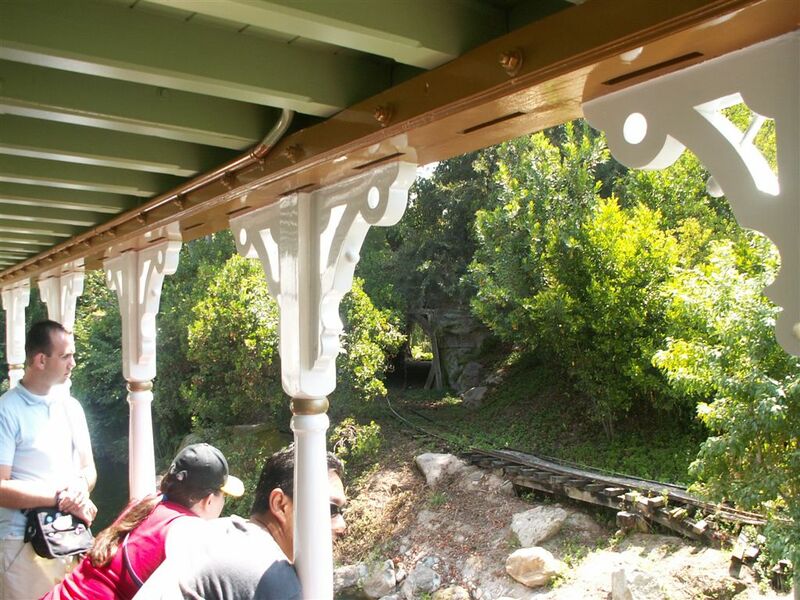 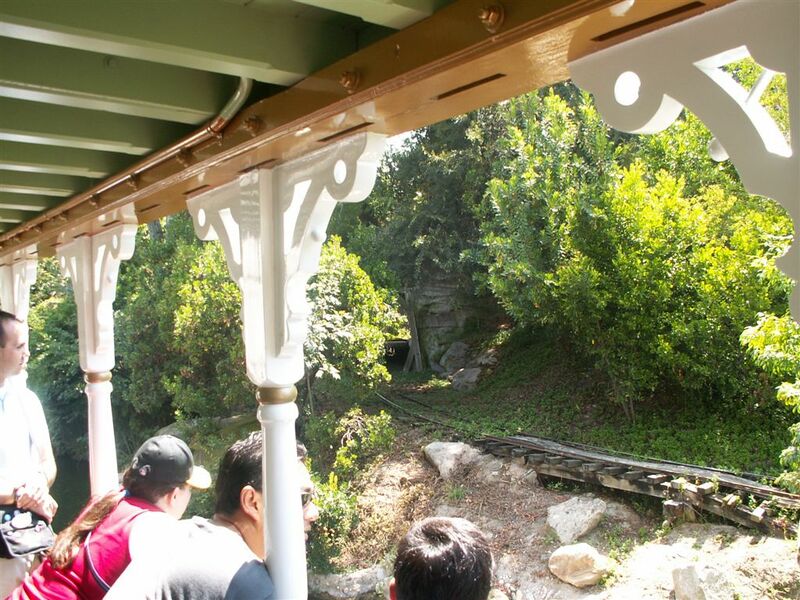 From something as simple as the mechanical bear to the former Rail line of the Mine Train through Natures Wonderland, and its Big Thunder look-alike engine stopped on the trestle. 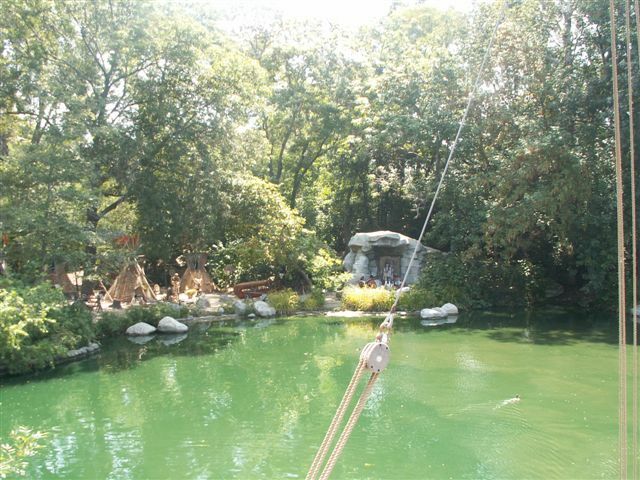 As we neared the river bend they played Robert E. Lee (with a line of crusin' down the river thrown in). After that they played a little thing where it was clear there was aplace for the audience to clap a part of the rythum, I don't know what it's called but it's the type of melody you know you've heard before even if you don't know the name, but when they got to the last bit insted of everyone just clappong along those two beats the steamship blew its whistle along with us. 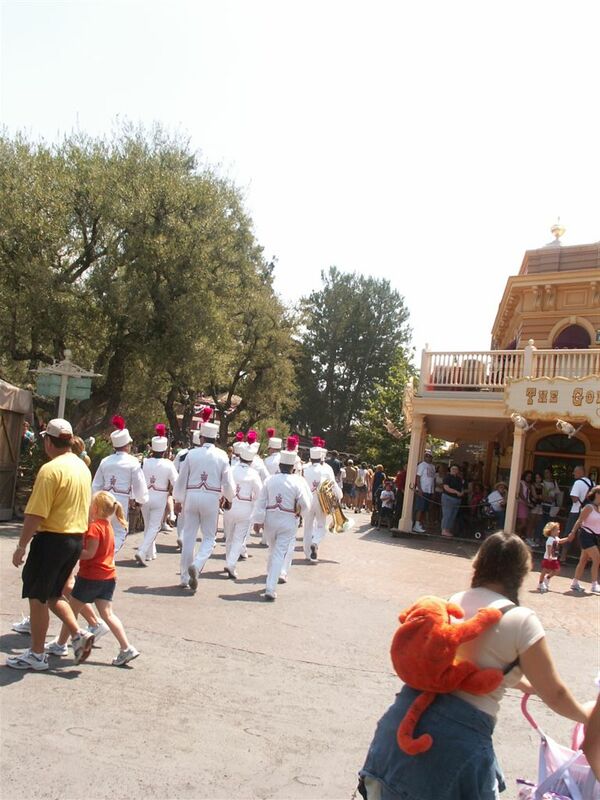 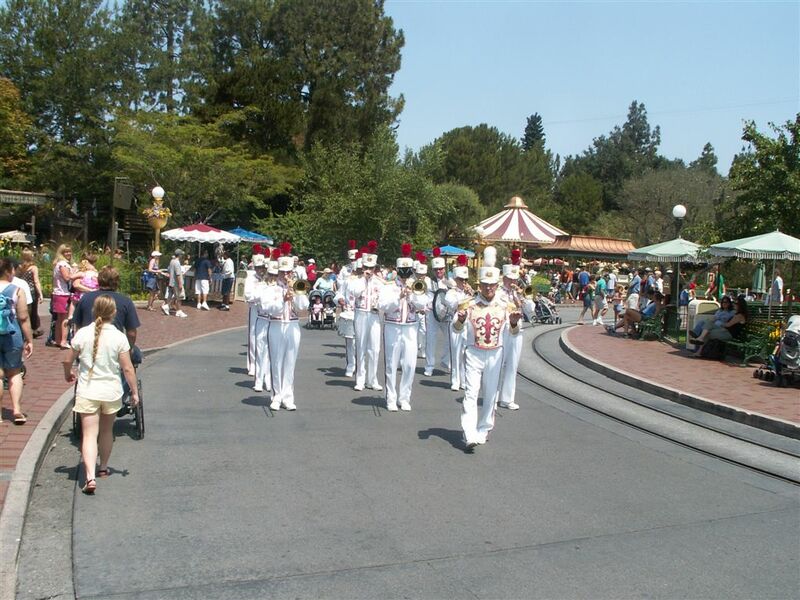 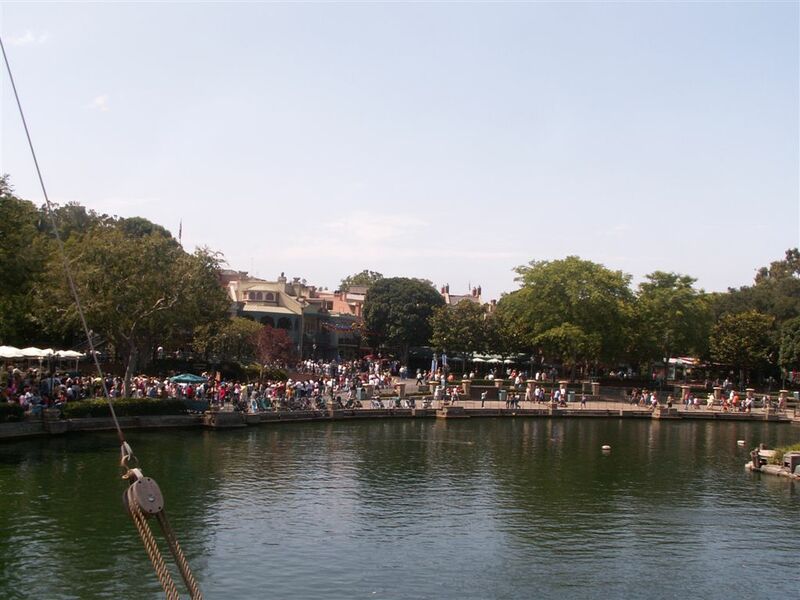 After dis-embaking I watched the band form up and followed them on thier march , leaving Frontierland the drummer just played a marching cadence, but once they got, onto Main Street they broke into The Bare Necessities, going off-stage where I had waited for them the previous day. By the time they marched off stage it must have been nearing 11:30, so I proceeded to a pay phone to touch base with Carlene she was already back in the park. 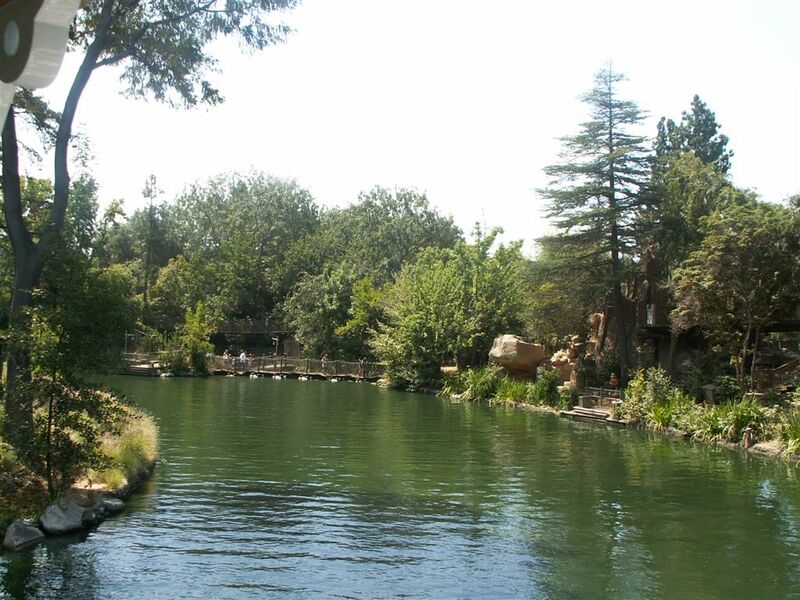 We met at the Frontierland Smoking area and proceeded to the Blue Bayou for our lunch seating.